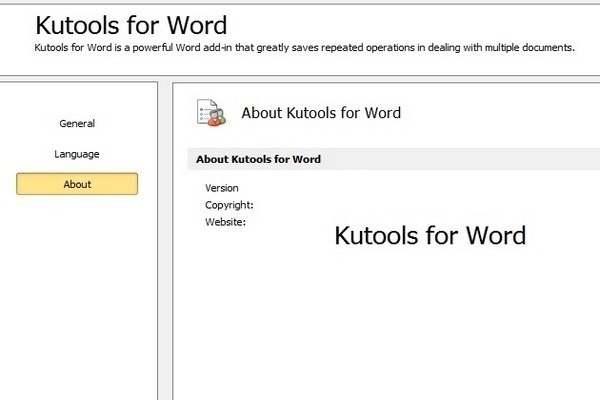 Kutools for Word is a powerful add-in that frees you from time-consuming operations which the majority of Word users have to perform daily! It contains groups of tools for saving hours of your time! You can use it to easily rename a document, copy a document file and paste the document file to any file location as you want, insert captions, and so on. Kutools efficiently helps you handle the complicated and repeated operations when you process the Word documents, and save your time by boosting your work efficiency. –Bookmark Pane: Lists all the bookmarks of the current document within a pane. You can navigate between the bookmarks quickly and comfortably. –Insert (Bookmark): Inserts a bookmark at the current cursor position. Move the cursor to the position you want to insert the bookmark and apply this operation. –Remove (Bookmarks): Removes all the bookmarks from the selection or the whole document. It will only apply to the selection, if you select a part of the document first. –Show/Hide (Bookmark Symbols): Show / Hide the bookmark symbols in the document. Tip: one click to enable it, click again will disable it. –Auto Text Pane: To save the selection into AutoText, and list all the AutoText entries within a pane for conveniently browsing and insert the AutoText entry in the document. –Check Box: Collects various check boxes for common use. It’s difficult for you to find the check box when you need to use one. — Radio Button: You can quickly insert multiple Radio buttons at once in the document. — Group the Radio Buttons: You can easily group multiple Radio buttons at once in the document. (Insert Multiple) Images: With this utility, you can quickly insert multiple images, with desired sort order, in the document. –(Remove) Breaks: A collection of tools for removing page breaks, column breaks, section breaks or all breaks in the selection or the whole document. –Remove Page Breaks: Removes all page breaks in the selection or the whole document with one click. It will only apply to the selection, if you select a part of the document before applying this tool. –Remove Column Breaks: Removes all column breaks in the selection or the whole document with one click. It will only apply to the selection, if you select a part of the document before applying this tool. –Remove Section Breaks: Removes all section breaks in the selection or the whole document with one click. It will only apply to the selection, if you select a part of the document before applying this tool. –Remove All Breaks: Removes all breaks in the selection or the whole document with one click. It will only apply to the selection, if you select a part of the document before applying this tool. –Short Last Line: It will adjust all the paragraphs which end with short last line (which containing less than 15 characters), By doing this, it can save you printer paper and ink when you need to print a document. –Resize Images: You can quickly resize all the image sizes based on a percentage of the current size of images. If you want to apply the size of one image to all other images in the document, please select the image first, and then apply the utility Resize Images with Selection.